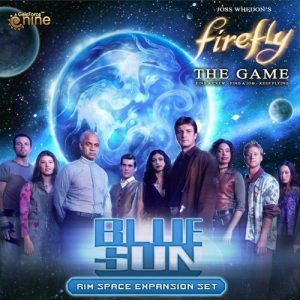 Firefly – Which Expansions Do You Need, and What Do They Add? 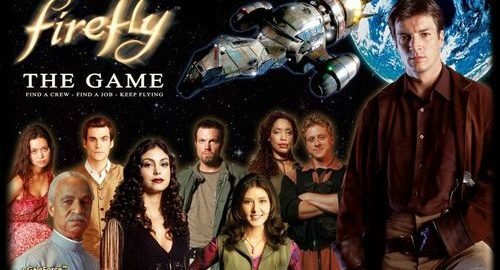 If you’re a fan of Joss Whedon’s cult scif-fi show about space cowboys (and if you have never watched Firefly, then you really need to check it out, although that is a topic for another time) then you are probably very interested in Firefly – The Game, published by Gale Force Nine. 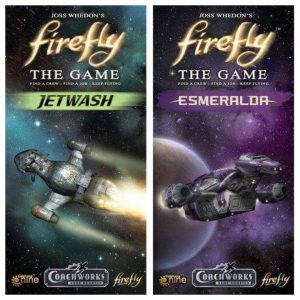 But with so many expansions to consider and try out, it can be difficult for new players to know which to purchase and what each expansion actually offers in terms of adding new mechanics or replayability, and which ones are likely essential to start out with. I’ve always said to new people about to make their first purchase and start out in the ‘verse that I consider Breakin’ Atmo and Blue Sun to be essential, Breakin’ Atmo because it adds some very good cards which I just keep mixed in to the base game decks, and Blue Sun because of the way it makes the Reavers a clear and present threat, thereby adding more tension to space travel and making you plan your routes more carefully. But what about the other expansions? 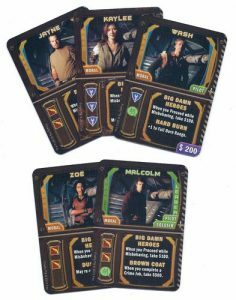 Well, a big damn hero called Ken Savage has written an excellent yet succinct breakdown of the 11 various expansions and what they do. So from here on in, its Ken’s words. Over to you Ken! (Matt steps away from the keyboard to go misbehave somewhere else). Fifty new cards, adds a number of jobs/equipment which reward specializing your crew. Surprisingly good expansion, for being so small. Five new cards, for the crew from the show. Makes them all stronger, not really a huge priority on getting this. New ship. The longer burn range makes it much stronger than the other starter ships. Comes in some versions of the base game. Adds PVP to the game. Up to now, you can have very limited interaction with other players and can’t really hinder them. This expansion changes that! But defending your ship is just as possible as attacking… A nice expansion, but you’ll want to check with other players that they want to play with PVP enabled! Adds a new area to the left of the board, Miranda, Meridian and Cortex Relay 7 being the most important areas. Jobs and rewards here in Rim Space are a bit lacklustre, compared to the risk of flying here – but this expansion is VITAL due to the new mechanics of having 3 Reavers and their movement being not totally player controller. In the base game, some players will just push the single Reaver ship to an out-of-the-way sector where it will never bother anyone. This expansion changes that nonsense! Essential purchase. Adds a new area to the right of the board, introducing Fanty and Mingo. More missions require and reward you for going to more dangerous Rim Space, including giving more reason to go to Blue Sun space. Adds “The Operative”, who is a “law” ship that operates outside of the core sector and flies similar to the Reaver change in Blue Sun. Another essential purchase. 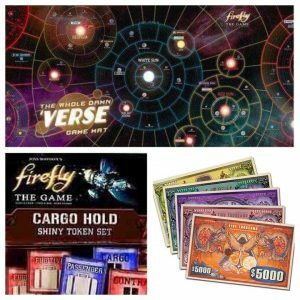 Two new ship packs, they come with starting equipment – which lowers your starting money. The equipment is useful, but not overpowered. More variety on startup makes these a nice purchase, but not essential. Once you get a great crew together in the game, Misbehaving and completing jobs becomes very simple and has low/zero risk. This expansion changes that alright! More (and tougher) misbehaves and nicer rewards make this a very important late game expansion. Want everything together, but not have to keep 3 different boards in place beside one another, as well as making the change to the original board at Harvest? This mat is for you! Lovely quality, pleasure to play on. you don’t “need” these. 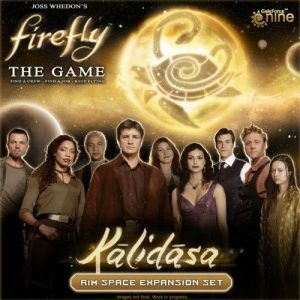 But every Firefly fan knows how important it is being shiny, so picking up a few of these can really pimp out your game. Ever play the game and think that the paper money of the future is strangely small? And I’m so rich, it’s annoying that there’s no $5000 notes? No? Me neither. But if it did describe you, and you really want to pimp out your game even further, then Big Money is the solution! General small improvements / reward for specialising crew? Breaking Atmo. Limited player interaction? Pirates and Bounty Hunters. No variety in starting ships? Artful Dodger / Esmerelda / Jetwash. Reavers no threat? Blue Sun. No danger to “wanted” crew as people avoid core systems? Kalidasa. Overpowered crew, missions too easy? 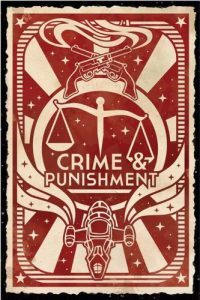 Crime and Punishment. Not enough variety in who to work for? Blue Sun / Kalidasa. 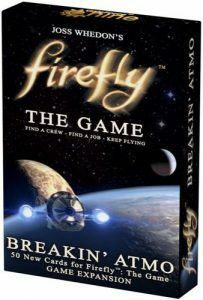 Main Firefly crew seem too “mundane”? Big Damn Heroes. Fed up slotting 3 boards together to play and placing a piece on Harvest? Whole Damn Verse mat. The game just isn’t shiny enough? Card Hold Shiny Token Set / Big Money. Matt here. 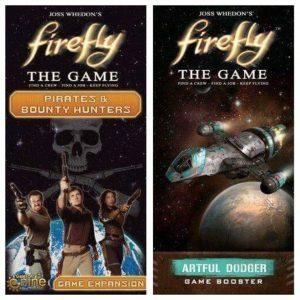 A big thanks to contributor Ken Savage for that awesome breakdown of the Firefly – The Game expansions. What about you? If you’ve played the game and it’s expansions do you agree with the above analysis? Which is your favourite expansion and why? Let us know in the comments below, and stay shiny.